A classic sugar cookie is sure to put a smile on the face of any kid I know. Decorate that cookie with a snowman at Christmas or their favorite television character for their birthday and you'll create memories that will stay with them for a lifetime. This recipe speaks to me as I get to unleash my artistic side and approach decorating each cookie as if it were a piece of art. 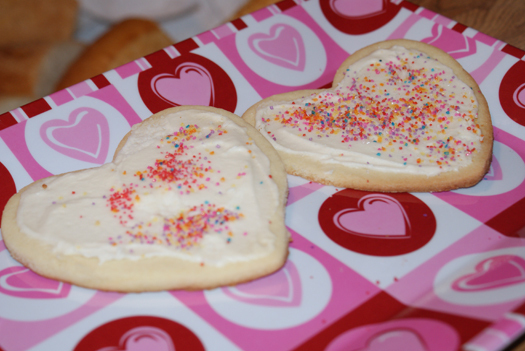 The cookie is a blank page that I can fill with beautiful colors, sprinkles, pictures...anything my heart desires. 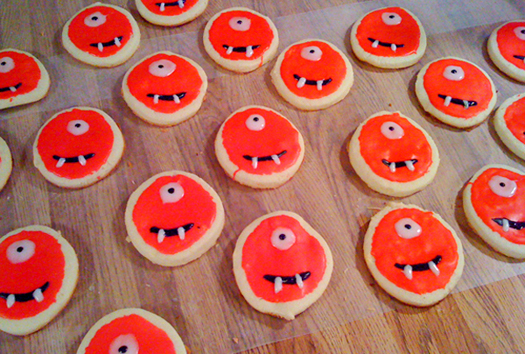 The Christmas versions were a stunning addition to my cookie platters during the holidays and the Muno cookies were slipped into little paper bags and added to the gift bags given out at my daughter's Yo Gabba Gabba themed second birthday party. They are so versatile that the possibilities are virtually endless when it comes to how you want to decorate them. I can't wait until my little girl is a bit older and we can have cookie decorating parties just for fun! Beat in the egg. Add vanilla. In a separate bowl, combine flour, baking powder and salt. Stir into the egg mixture a little at a time. Cover dough and refrigerate for at least one hour. Roll out dough onto floured parchment paper to ¼ inch thick. 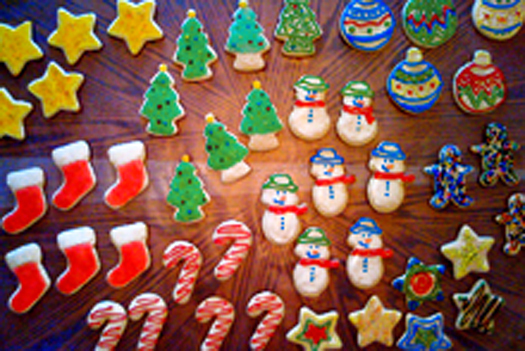 Cut out shapes with cookie cutters leaving at least a ½ inch between each cookie. Remove dough surrounding cookies and transfer the parchment paper with the cookies to a cookie sheet. Bake cookies for 10-15 minutes. In a small bowl, stir together the confectioner's sugar and milk. Stir in the corn syrup and almond extract until smooth. Separate icing into small bowls and add food coloring to create the colors you want to use. If they icing becomes too thick, add a teeny tiny amount of corn syrup to loosen it up. Spread onto cookies using a small brush. Let icing set. It will look wet, but will harden to a beautiful glossy finish and will be totally stackable! These cookies are also awesome topped with Cream Cheese Frosting. Love these! Thank you so much for sharing!